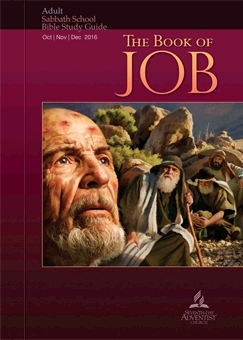 COMMENTARY ON "CURSE OF THE DAY"
Today’s lesson opens up with a commentary on the book of Job. What I want to point out is the last assertion of this sentence. What does the author mean by conflict? Generally, when one uses the word it implies a struggle between two ontologically equal forces. For example, if I were to step on an Ant, you probably wouldn’t describe it as a conflict. That doesn’t really paint the right picture. This word though actually works perfectly to describe the SDA view though. They see it as possible for Christ himself to have failed. “The temptations to which Christ was subjected were a terrible reality. As a free agent He was placed on probation, with liberty to yield to Satan’s temptations and work at cross-purposes with God.” EGW, Selected Messages, Bk. 3, p. 131. “For a period of time Christ was on probation. He took humanity on Himself, to stand the test and trial which the first Adam failed to endure. Had He failed in His test and trial, He would have been disobedient to the voice of God, and the world would have been lost.” EGW, Signs of the Times, May 10, 1899. Clearly, SDA do believe that it is possible for Christ to have failed. So to them this is a conflict of at least semi-equals. In contradiction to this the Bible teaches that God is omnipotent. The author of todays lesson touches on what is referred to as the “problem of evil”. He doesn’t dig into the real philosophical issues, but since the reader of this commentary likely will run into those I will give a simple breakdown. First I want to point out a simple mistake in the lesson. That statement in red isn’t an accurate one. Job did have an answer and it is the same that we all have, I will post it below. The fact is Job deserves that and far worse as do we all, the only response or answer is to repent in dust and ashes. Generally, the problem of evil goes like this, how can an all powerful God be all Good when evil is present in the world? This is a philosophical issue not a Biblical one, while it can be helpful to use philosophy in submission to scripture, one should never use it in a magisterial fashion. That is, we don’t use philosophy to bend scripture around. Todays lesson takes the lamentations of Job, juxtaposes them against poetic narrative, and then draws conclusions on the state of the dead. Why do they do that? Because in the SDA hermeneutic that is all you can do. They cannot turn to systematic passages actually teaching the state of the dead simply because it would flatly contradict their beliefs. This doesn’t mean that Job and Ecclesiastes are wrong. It simply means the rest and reprieve do not preclude existence. Just as you still exist when you are asleep you still exist when you are dead. Paul doesn’t speak of a pause between the two at all. He expects to receive something far greater upon his death. You don’t have to be specific as to what exactly this is, the Bible actually doesn’t really reveal much in the way of details. But to deny it entirely us unbiblical. At the end of the day it comes down to the words of Christ. Here is the deal, you either accept the words that Jesus says up there or you reject them. I take “shall never die” as “shall never die”. I do not interpret it as “shall die and then come back later”. I think the latter would be to do damage to the text. I remember how much Ecc 9:5 was drilled into my head as a child though. So for the sake of the reader I will present it below in a fair manner. Notice that Solomon begins and ends with “under the sun”. It is true that the dead have no part at all under the sun. This is a good reason not to believe in ghosts and such but it doesn’t preclude existence of the dead in heaven. Especially since the Bible flat out teaches that in other passages. Don’t rebel against the Word, accept it all as a whole. On the whole I think this was a good lesson. I’m not going to nitpick this one. Read it and enjoy. I will say that we should keep in mind Christ even in our greatest suffering as he has overcome the world. And even if we cannot bear what we are going through we should know that he has, and that in the eschaton (second coming) such pain and suffering is gone for all eternity. Even thought it was only mentioned briefly, I would like to point out that the health message isn’t in scripture. Nowhere is it taught at all, even the go to prooftext (1 Cor 6:19) is talking about sexual sin rather than healthy eating when placed back in context. Also, in the Bible you see Peter and Noah being commanded to eat meat, along with Jesus eating fish and lamb, etc. You would expect some whiff of vegetarianism to pop into the text as a prescriptive command now and then, especially after the cross if it is supposed to be some great end times distinctive. But alas it is not. Such issues are wisdom issues, not sin and righteousness ones. If you want to be a vegetarian or eat meat then do so, and don’t tell others they are sinning if they don’t go along with your life choice. You don’t have the scripture to back that up. The author quotes Ellen White at the end regarding the Love of God. While this is probably one of the less heretical statements she has made I do take issue with the word “assumed” a human nature with regards to Christ. It would be more theologically accurate to say that he “received” as the former would flat out contradict the immutability of God and could be possibly interpreted to mean that Ellen White is saying that Christ no longer has or never had a Divine nature. If you think I am being too nitpicky I would recommend further study on the hypostatic union. This isn’t one of those things that it’s okay for a theologian writing SDA quarterlies to simply overlook. My second problem is that one does a disservice to simply jump to the Love of God and draw conclusions from it whilst removing it from it’s hermeneutical context. The Love of God doesn’t really take on full meaning without the Holiness and Wrath of God also explained. It is because of God’s infinite holiness that he righteously is wrathful against sin. Thus his Wrath is infinite too. So to is his Love by which he has provided an infinite propitiation for sin. Namely in his body on the cross to save us from our sins. In this light one can meaningfully discuss the Love of God in a Biblical manner. Otherwise you end up defining love based on the worlds definition and there is no end to the heresies you can pull out of that magic bag. In response to the heathen that they chose to quote for 95% of Fridays thoughts I will say this. I find it interesting that he has chosen to the conclusions of western thought and logic to rebuke the foundations of it. That seems intellectually inconsistent and self-defeating to me. With regards to the questions at the bottom I feel sorry for those who will be attempting to answer them on the morning of the 29th. As I demonstrated on the 24th , Adventism straight up ignores much of scripture in order to hold to their unbiblical doctrine on the nature of man. If you question the brazen nature of that conclusion let me challenge the reader. Take some of these passages listed below to your pastor or Sabbath school teacher. Actually take the time to read them and then see for yourself if they do backflips trying to make each one say something other than what it plainly says. Make your own discernment there as to who is selling you a bill of goods. Copyright 2016 BibleStudiesForAdventists.com. All rights reserved. Revised October 21, 2016. This website is published by Life Assurance Ministries, Camp Verde, Arizona, USA, the publisher of Proclamation! Magazine. Contact email: BibleStudiesForAdventists@gmail.com.